I also enjoy watching these athletes, each one representing a different sport. I don't really have a favorite sport, though. Hence the widely different atheletes below. David Robinson is, in my opinion, one of the few true role models in the NBA today, as well as a talented center for the San Antonio Spurs...well, this past season doesn't count due to his back problems. Yes, it is sad that students in logic classes at San Francisco State had to prove that Jerry's knee didn't exist. However, even though the human record book is one-of-a-kind, the 49ers are still a damn fine team. Even if Green Bay beat them. 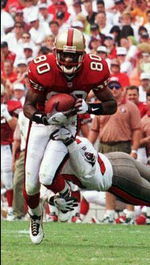 About Jerry Rice's decision to attempt a comeback on December 15, I will not be one to second guess him. It was great to see him play this season, even though the time was rather short. I look forward to seeing him next season. 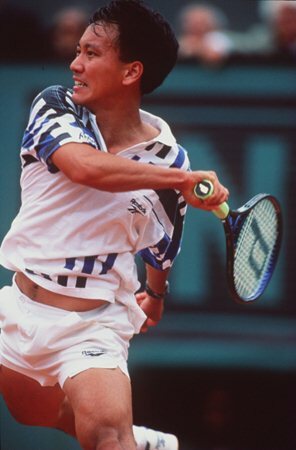 Michael Chang, in my opinion, is the best professional tennis player who has never attained #1 status. Yes, I have my own page on Tiger Woods. Even though I generally dislike Nike. I just separate Tiger from his association with Nike. 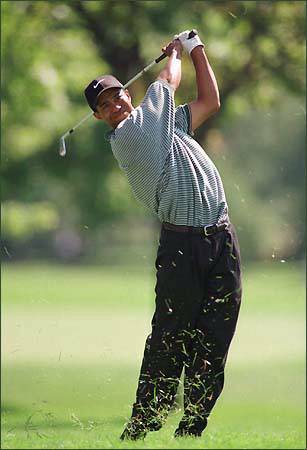 I mean, there are plenty of things to talk about when someone mentions Tiger...like his golf game.